Leathersmith Designs Inc. is a Canadian manufacturer of quality leather goods, promotional leather products and a distributor of leather craft supplies. Our specialty is custom imprinted personalized leather products. We sell our leather products in the United States, Canada and overseas. All prices advertised in this web site are in Canadian currency (CAD) but may be displayed in other currencies based on the current exchange rate. Our main personalized leather goods imprinted include promotional leather products (imprinted leather key tags, leather drink coasters and leather bookmarks) as well as more customized leather goods (leather name belts, guitar straps, dog collars, dog leashes, big and tall belts, rifle slings, change coin purses and wallets). Company or personal names are stamped individually with hand tools or imprinted by machine for large production runs. Our one of a kind custom leather work consists mostly of leather knife cases and various other leather tool and electronic cases. Quite often a customer comes in our shop with an idea for a custom leather product that we have not made before and we are able to create the leather item they are wanting. Some of our leather craft supplies stocked for people doing leathercraft and leather work are leather hides, leather lace sewing supplies, leather craft tools, solid brass belt buckles, strap buckles, rapid rivets, snaps, leather craft hardware and leather dyes. We stock a big selection of solid brass hardware and high end tooling leather. Our goal as a leather product supplier is to provide you, the customer with the best quality product and service possible at competitive prices. Your satisfaction is guaranteed. 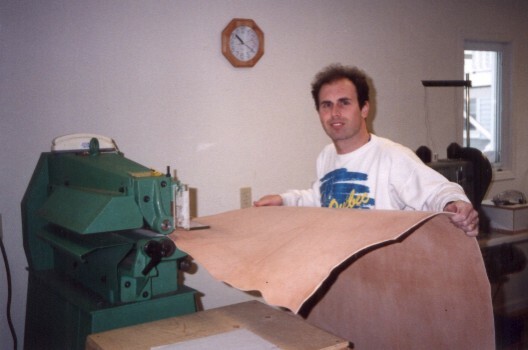 Jamie Hartling who created Leathersmith Designs Inc., started crafting leather goods for sale in 1975. His initial leather experience was gained through a leather course offered through Dartmouth Continuing Education and through local leather shops in Halifax and Dartmouth. 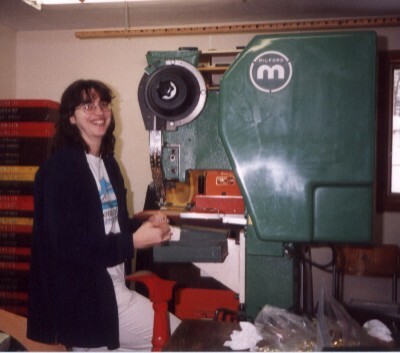 A friendship was developed with the owner’s of George’s Shoe Repair in Dartmouth. While in high school, Jamie would bicycle to their leather shop many days after school where George would share leather working tips and suggestions. As the business grew, Jamie traveled to Montreal, Toronto and New York for advanced training from leather trades people. Business education was earned through his Bachelor of Commerce Degree at Saint Mary's University. Quentin Burns joined Leathersmith Designs in 2017. Originally from California, Quentin moved to Nova Scotia in 2015 to pursue her art and writing. She holds a diploma in animation from Nova Scotia Community College, as well as an MA in English Literature from St. Andrew’s University in Scotland. As she has been sewing from a young age, her interest in handcrafts started early and her skills and excitement easily transferred to custom leather work. Quentin’s precision and artistry in leather was enhanced from many years experience working as an illustrator and designer as well as years studying traditional art and life drawing. Quentin showing a personalized guitar strap. Joined by his wife Gail Hartling, father Gerald Hartling and other employees we now ship leather products and supplies coast to coast for businesses and consumers. Gail originally developed our first website to move us online to reach the world market. She now concentrates on the accounting end of the business. Gerald now focusses on corporate customers. If you come to Dartmouth, Nova Scotia, visit our show room and production area. Gail riveting promotional key tags. 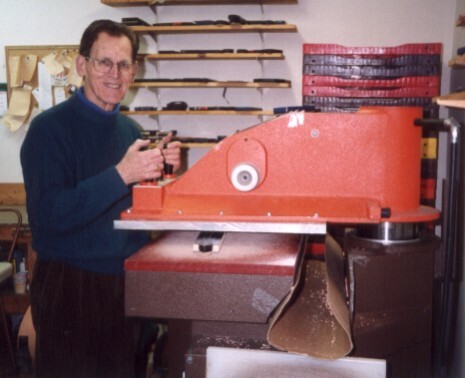 Gerald cutting leather products on the hydraulic clicker press. 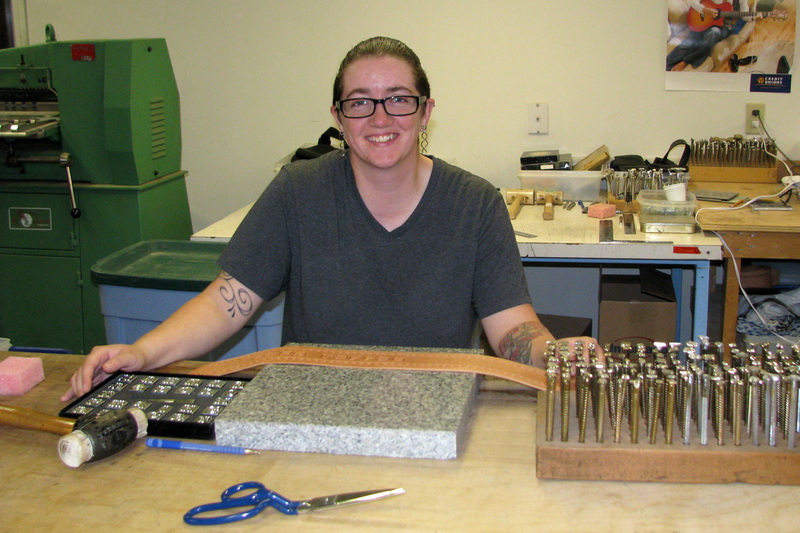 Alana hand stamping designs and lettering in custom guitar straps. Alana Leblanc joined us in 2004 after graduating with a Bachelor of Fine Arts degree from Nova Scotia College Of Art & Design and continued working with us until 2018. 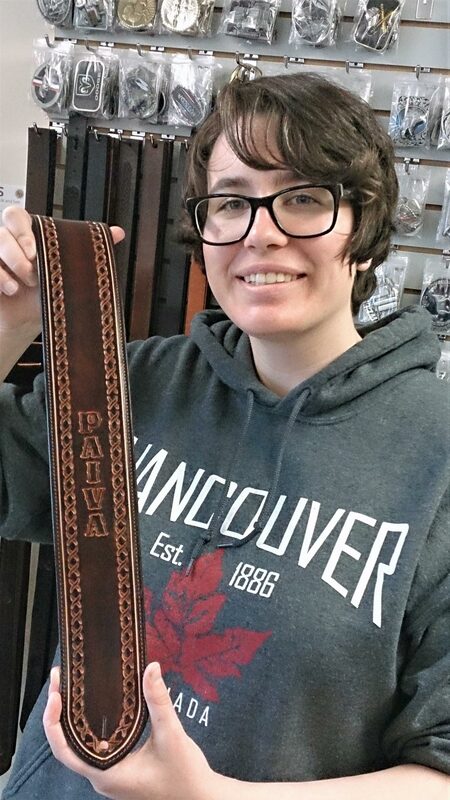 Alana's artistic skills, creative ideas and eye for design resulted in many more product lines being added to Leathersmith Designs. With her eye for detail and colour, customers were assured to be completely satisfied with the new leather products that were created.